Remember, about this time last year we had a typhoon cross the pacific and slam the Sierra with rain and high elevation snow. Of course it did not snow again until mid-January. I do not see that happening at all this year. There are indications that around the 18th of this month, our blocking high will break down. Around that same time the storms are going to start picking up strength. 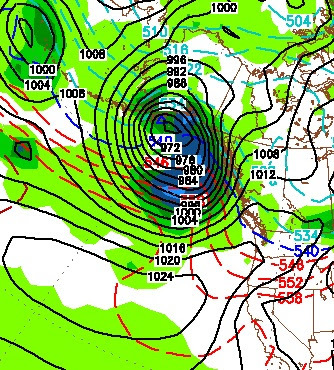 Look for something to happen in the Sierra around the week of October 22nd. I will keep an eye on this pattern change and report accordingly. The following forecast image shows a much stronger storm well to our north.